The Truth About Open Door! What you need to know about Open Door and many other knock off's of "We Buy Ugly Houses"! I think by now, most people have heard of the new player in the real estate market. 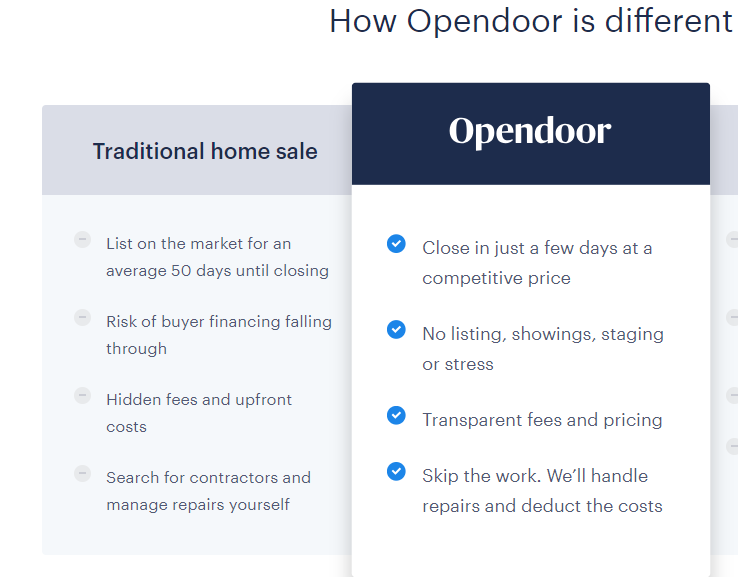 Open Door has now been around for a couple of years and they have surprisingly been able to buy a quite a few homes from local homeowners who were in desperate need to sell their home fast. The first problem with selling to a company like "We Buy Ugly Houses" or "Open Door" is they are looking for sellers who are desperate to sell. Keep in mind that "desperation" and "top dollar" should never be used together in the same sentence. You already knew that right? Let's move on. As you can see in the graphic, which you will find on Open Doors home page, they try to lure homeowners into their scheme by using a flawed premise, actually a few of them. Where shall we begin? First, Open Door tries to suggest that your home will be on the market for 50+ days plus time to close. Yes, when you list your home with an agent on the market, it will take some time to sell. But, a good Realtor will sell your home much faster than 50 days. My firm sells homes in half that time. After you get a contract on your home, it will take on average 30 days to close however. Second, they try to scare the homeowner in suggesting that the buyer's financing could fall through, like that's a common occurrence. It's not. In my 20 years of selling homes, I can count on one hand the number of times a buyer's financing has fallen through. Being concerned about a buyer's financing should be no concern at all. The third thing they mention and this is the most outrageous and a downright lie. They say there's hidden fees and upfront costs associated with selling a home the traditional way. Again, this is fake news! I don't know what real estate company or agents they're talking about, but I can assure you, when a seller lists their home with me, there are no upfront costs and there are most certainly no hidden costs. When I meet with a seller, I show them right up front all the closing costs associated with selling a home that are due at closing. Open Door is spreading false claims! The last thing Open Door mentions is that with a traditional sale, a seller has to search for contractors and manage repairs yourself. This is more fake news. I'm beginning to think that 'Open Door" is a branch of CNN, they're spreading so much false claims. With a traditional sale, as long as the seller uses a top agent like myself, we'll help the seller with locating and hiring contractors and manage all the repairs for the seller. This is the role of the sellers agent. You have to wonder, if Open Door is spreading so many false claims, what else are they lying about??? Makes you wonder does it not? If you want to sell your home with a reputable Realtor with almost 20 years of home-selling experience, where there will be no surprises and no "fake-news", reach out to me today and let me show you the right way to sell a home.